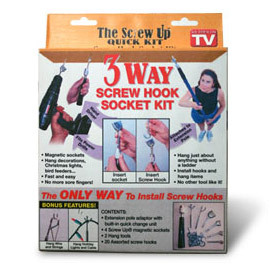 The Screw Up® Quick Kit for Extension Poles and Power Drills gives you a choice of socket sizes and hang tools. The built-in quick change unit and magnetic sockets allow rapid and safe installation of items to high places, such as ceilings, eaves, and tree limbs. Hang Christmas lights, bird feeders and decorations without a ladder! If you plan to use The Screw Up to hang holiday lights, we strongly recommend you order 50 to 100 additional screws. The most commonly used screw hook for hanging holiday lights is the Number 14.